UTICA, N.Y. — As we enter the final stretch of the presidential elections, Democratic candidate Sen. Barack Obama of Illinois, appears to have solidified his support among the large majority of Hispanic likely voters. Obama is favored by 72 percent of likely Hispanic voters while Republican candidate Sen. John McCain of Arizona holds just 22 percent support, according to a new Zogby International telephone survey of Latinos nationwide. Another 4.5 percent of Hispanic likely voters support other candidates while 2 percent remain undecided. Zogby International’s telephone survey of 704 Hispanic/Latino likely voters nationwide was conducted Oct. 16 – 30, 2008, and carries a margin of error of +/-3.8 percentage points. Obama has maintained his stronghold among Latinos since Zogby’s earlier nationwide telephone survey of Hispanic likely voters was released on Oct. 20. The earlier poll showed 70 percent of Hispanic respondents favored Obama while 21% supported McCain. Zogby’s first survey was conducted among 600 Hispanic/Latino likely voters on Oct. 3-17, 2008 and held a margin of error of +/- 4.1 percentage points, the release said. In the 2004 presidential elections, Latinos helped propel Republican George W. Bush to re-election when he secured 40% of the Hispanic vote. This year, with the increase in the Hispanic population and expanded voter registration efforts nationwide, the Latino vote could be a determining factor in all the battleground states. In our latest survey, an estimated 58% of Hispanic likely voters identify themselves as Democrats and 19% call themselves Republicans, while another 23% percent consider themselves Independents. Both presidential candidates continue to garner support among Latinos in their respective parties. McCain now enjoys 78% of Hispanic Republicans up by two percent while Obama’s support has increased to 92% from 83% in the earlier survey. Among Latino respondents who identify themselves as Independent voters, Obama maintains a majority of support. The Democratic candidate now enjoys 66% of support among these respondents, an increase of 6% from our previous survey. There has been a marked decrease for McCain – from 30% to 18% – among these swing voters. Each presidential candidate has strengthened his support within his traditional ideological base. Senator Obama now enjoys 89% support among liberals up 5 points while McCain’s support among conservatives has risen to 45% from 35% of Hispanic likely voters. Yet, Obama maintains much support – 47% – of Hispanic likely voters who consider themselves conservatives. The large majority of moderates – 76% – continue to support Obama while 18% support McCain. Catholic likely voters in the Hispanic community have increased their support for Obama to 78% from 72% in the past several days while McCain’s support has dropped by more than three points among this subgroup to 18%. Among Hispanic Protestants surveyed, Obama’s support remains at 60% and McCain’s support has increased by more than 5 points to 36%. In recent years, there have been an increasing number of self-identified “born-again” or “evangelical” Christians in the Latino community nationwide. Although traditionally this subgroup identifies itself as conservative and is supportive of the Republican party, this year Hispanic “born-again” respondents are divided in their support for the two presidential hopefuls. 42% of respondents favor McCain while 53% support Obama. Obama maintains a majority of support among all age groups surveyed. Among 18-24 year olds, 80% favor Obama while McCain supports remains at about 9%. Surprisingly, Third Party candidate Ralph Nader is now supported by 8% of this youth vote. In Zogby’s Oct. 20th poll, Nader had not even registered any support among these respondents. At the same time, Libertarian candidate Bob Barr, who had enjoyed 4% of support among these younger Hispanic voters in our earlier survey, no longer maintains any support in this subgroup. McCain’s highest amount of support – 34% – is among the following age group, 55-69. Obama has a majority of support in the Latino community among all income groups surveyed. The highest support for Obama – 77% – is among individuals who earn less than $25,000 while McCain’s strongest support is among individuals who earn more than $100,000. Within this high-income Hispanic subgroup, McCain has lost significant support from 44% to 28% since our last survey. ANTA MONICA, Calif., Oct 28, 2008 (BUSINESS WIRE) — With barely a week left in the campaign, the anticipated record-breaking turnout of at least 9.2 million Hispanic voters could be key to winning swing states such as New Mexico, Nevada and Colorado. In June 2008 when general election campaigning began in earnest, in an article entitled “Winning the Latino Vote in the General Election,” as head of Poza Consulting Services (a market research and strategic planning consultancy targeting U.S. general market and Latino audiences) I explained that the key to reaching Hispanic voters was to focus on their needs as the hardest hit of the hardest hit in the current economic downturn. The average U.S. Latino has more children and earns less than the average American. The relatively lower-paying jobs Latinos tend to hold typically don’t offer health insurance, further endangering their tenuous grasp on economic survival. Added to this, the vast majority of jobs held by Latinos are in construction and service industries, among the first and worst hit in the current economic crisis. Unemployment statistics for the state of California bear this out, reporting a 2.1% increase for Latino workers from July 2007 to July 2008 compared to a 1.2% increase for non-Latino Caucasians during the same period. Among the ranks of the working class currently struggling for survival, Latinos represent a disproportionately high number. It’s interesting to see how strategy has evolved or devolved for each candidate in the face of this. This strategic blunder this close to the finish line is symptomatic of the McCain campaign. It suggests early ads targeting the economy were a lucky shot in the dark rather than a strategic insight. 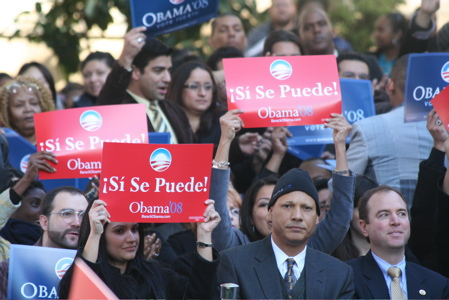 By contrast, Obama’s campaign as recently as June did not appear to have a strategy for targeting Latino voters; however, it did have the good judgment to incorporate hip and catchy videos made by Miguel Orozco, an enthusiastic supporter passionate about Obama’s candidacy and ‘introducing him’ to fellow Latinos. While hip and catchy, these videos did not specifically promote Obama as a candidate who understands the challenges Latinos face. Recent ads however do. A television ad in Spanish titled “No Greater Priority” calls out hardships facing Latinos in New Mexico, including soaring unemployment rates, the rising number of homes in foreclosure and the increasing number of children without health insurance, contrasted with McCain’s now famous comment of “the fundamentals of our economy are strong.” Radio ads deliver focused messages comparing McCain’s healthcare plan to Obama’s, suggesting McCain favors insurance companies while Obama favors Latino families. The latest CNN/Opinion Research Corp. polls show Obama leading McCain 65 to 30% nationally among Latinos. And in the important swing state of New Mexico recent polls show McCain’s 4-point lead disappears when the Latino vote (32.4% of registered voters) is factored in, leaving Obama with an 8-point lead. For Latinos, as with any demographic group, there is no inherent mystery in getting their vote. It’s a matter of understanding what is most important to them and then clearly communicating that understanding. Many have wondered why Hillary Clinton, “an upper class White lady” as one blogger put it, was so successful with Latino voters. Some suggested it was Black-Brown tensions undermining Obama, but this was not the case. During the primaries when Obama’s outreach to Latino voters was nearly non-existent, Clinton’s campaign was bulls-eyeing the needs of working class families, reaching out to Latinos with this same message. And while some are surprised to see Obama carrying the Hispanic vote in states previously won by Hillary Clinton, this is also no mystery given that he has picked up where Hillary left off, refining his strategy as evidenced in his recent Spanish language ads. As for John McCain, in a campaign that has careened from tactic to tactic, void of coherent strategy or sense, it seems he almost hit and then veered away from the opportunity to connect with and win what could have been a decisive voter block for him in this election. Ines Poza, Ph.D., is the owner of Poza Consulting Services, a market research and strategic consulting firm based in Santa Monica, CA. Contact Dr. Poza at 310.264.4637.